Since its debut in 2001, the Topps Heritage line has bridged the old and the new, showcasing current stars with old designs. Staying somewhat faithful to the original sets, "errors" and variations are often recreated as well as pop culture nods from back in the day. One of the most widely collected brands each year, Heritage has been particularly embraced by set collectors. 2013 Topps Heritage Baseball sticks largely with the formula that's worked in the past. Here and there, collectors are going to find tweaks and changes, but, overall, it's still a nod to the past. In this instance, it's 1964. Beatlemania was sweeping the world, Martin Luther King won the Nobel Peace Prize and America was still coming to grips with the assassination of President John F. Kennedy. With the first wave of Baby Boomers starting to graduate high school, the social climate in America was changing and baseball was an escape. How does that carry over to 2013 Topps Heritage Baseball? We asked Topps Brand Manager Jeff Heckman via email, who is heading up a Heritage Baseball set for the first time. 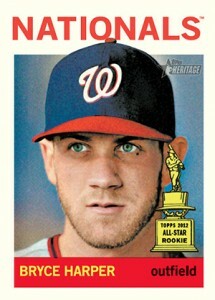 Jeff Heckman: I think collectors will greatly enjoy 2013 Topps Heritage. We have captured all of the core elements of what has made Heritage a staple for baseball collectors each year along with a number of exciting additions from 1964. Collectors will also be pleased that we have inserted more autographs this year. CC: What are some of the new or improved aspects of the line that you're most excited about? JH: Here are the features I am most excited about: more autographs, Venezuelan parallel, Mini Parallel, 1964 Bazooka design, 1964 Topps Tatoos Buybacks, 1964 Bazooka Stamps Buybacks, Beatles Buybacks 1964 Giants Box Loaders. CC: Why do you think the brand remains so popular with collectors after all these years? JH: I think it remains popular because it showcases current and former MLB stars on an iconic design from Topps history. It is also a great product for set builders with all of the variations, inserts, short prints, and errors. CC: What sort of work goes in to keeping it fresh each year? JH: Similar to all releases, we take a close look at what collectors liked and didn’t like about the past year’s product. For Heritage, we look to see if there are unique features that Topps produced in that year that we can feature in the product as well as any newsworthy or cultural significant events. CC: Are there any retail exclusives collectors should be looking for? CC: Have there been any preliminary talks to have another Heritage High Number set? If so, do you think it will stick with the online exclusive format? JH: Yes, we have discussed offering another Heritage High Number set this year, but no final decisions have been made yet. CC: Is there any one card in this year's set you're most excited about? JH: I am most excited about the Beatles buyback cards. It was a huge moment in Topps' history to sign a deal to offer Beatles trading cards. I am also a music fan and it is very cool to see the Beatles captured in various poses from 1964. I think this insert will generate a lot of interest from Topps collectors and Beatles fans. 2013 Topps Heritage Baseball releases officially on March 4.
what 2013 baseball set will have the last stan musial autos in them ? i remember reading about it some where but i cant remember. steve � I haven’t heard of any being the last. With the advent of autographed stickers, they could continue indefinitely. There may have been a note somewhere, but I can’t recall it off the top of my head. I’m really excited about this set, but I’m curious about one thing. I keep hearing about “more autos”, “2x more autos”…yet each hobby box will contain just one auto OR relic. So here will all these autographs be? Retail? Alex � Autographs are appearing twice as often, but still not one per box. I can’t recall exact odds from earlier years, but if autographs were 1:144 packs in 2012, they’d be 1:72 packs in 2013. Odds for autos last year in hobby packs – 1:289. Look for this year to be around 1:144. I think my issue with Heritage always ends up being the insert sets, which unfortunately tie into the nostalgia of the sets. Sadly, for me, the nostalgia is part of the problem. Back in the day, when we got a “special” 1,000 yard club card or a “special” glossy all-star card in the pack, it was cool but not as cool as getting the real card of the same player. I think I’d prefer that the sets be a little more like the modern Bowman sets with various parallel sets (international, gold, chrome, etc) than keep up with the archaic subsets like “elite performers” or “World News”. I like the idea of the Venezuelan black backs and possibly some other, additional variations instead of the current ones. Additionally, maybe there should be some “hot” SP packs in the future, with either a full pack of high number cards or just a box with one High # sp per pack in addition to whatever other bonus card (like the purple parallel hot boxes this year) you’d normally get. You could even get extra crazy and make ONE “ultra hot” box with an “action variation” in every pack (or similar). Otherwise, nice work. I still collect Heritage because I like them and you don’t go overly screwing up the formula that works (and I like). Additionally, is there any word as to whether or not there will be another “internet exclusive” high series this year? Personally, I thought those were awesome.